1. Rinse, peel and dice the potatoes. Peel and slice the asparagus, saving the tips for garnish. 2. Melt the butter in a large saucepan. Add chopped onions, potatoes. Stir and cook for about 10 minutes. Add white wine, and then reduce by half. 3. Pour chicken stock, bring to a boil and let simmer gently for 20 minutes. 4. Add sliced asparagus (except the tips) and cream, and then continue to cook for another 5 minutes. Remove from the heat, blend in a food processor, and then pass through a sieve. 5. Just before serving, stir and correct the seasoning. Ladle the soup into deep plates, garnish with blanched and split asparagus tips, spoon of cr&egrave;me fraiche and fresh chervil sprigs. PREHEAT oven to 400°F. Place chicken wing pieces in greased 13×9-inch baking pan. Bake 30 min. DRAIN pineapple, reserving 1/4 cup juice. Mix barbecue sauce, pineapple and reserved juice; add to pan with chicken, stirring well to coat. BAKE 30 min. more or until well browned and sauce is thickened. 1. Tuck parsley, thyme, salt, and pepper into the cavity and truss the chicken. Rub the oil over the skin of the bird and season generously with salt and pepper. 2. 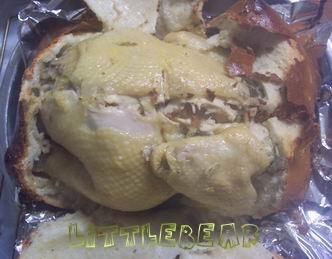 Place the chicken in a baking pan and cook in a 220C pre-heated oven for 45 minutes, basting the bird with its juices several times during the cooking. 3. Remove the chicken from the oven. Carve and arrange it on a warm serving platter. Pour excess of fat from the tray, then deglaze with some chicken stock or water, stirring with a wooden spoon to detach the browned bits that stick to the bottom, and let simmer briefly. Pour into a sauceboat. * Garnish with roasted potatoes and fresh rosemary. 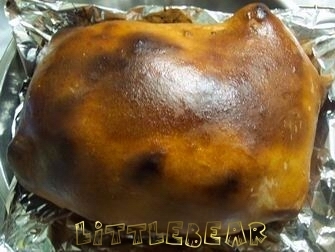 LittleBear: o的麵包好好食o架. .. 男朋友同媽媽都話o的麵包最好食呢. . .hee hee. 基本上係唔駛o黎隻雞o架喇. . .^^. . .不過呢. . .焗到一陣. . 你要留意o下個包包有無燶呀.